Bedroom with carpet and flat screen t.v. 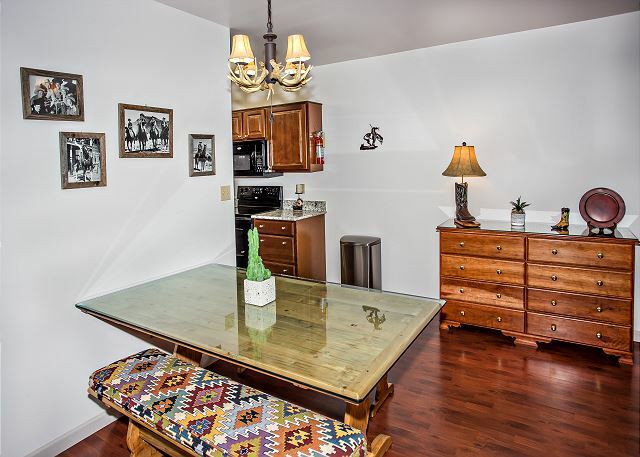 If you love the idea of the Old West theme combined with the Great Smoky Mountains, come on over to Cedar Lodge Condo CL603! 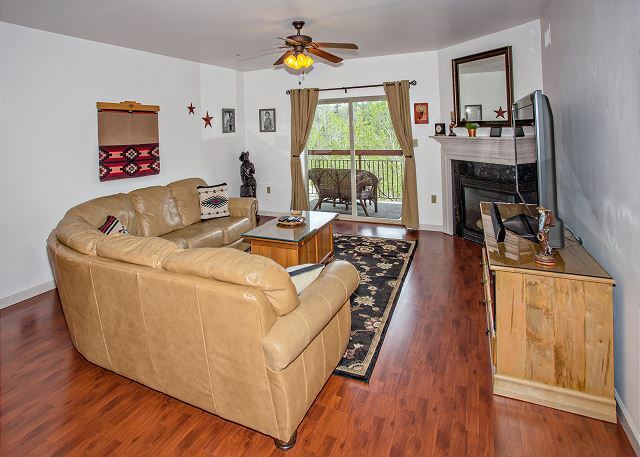 We outfitted our vacation condo with a taste of the West, complete with pictures of Roy Rogers, and added mountain charm like a leather sectional sofa, hardwood floors, and a river running past your private balcony. We had fun searching for items to make our condo enjoyable and different. We also aimed to make it comfortable and relaxing with a pillow top mattress cover in the master bedroom and wicker furniture on the balcony! Please sign our guest book while you are here – we’d like to hear about your stay! Convenient to Dollywood, The Great Smoky Mountain National Park, hiking and shopping getaways at The Tanger Outlets! 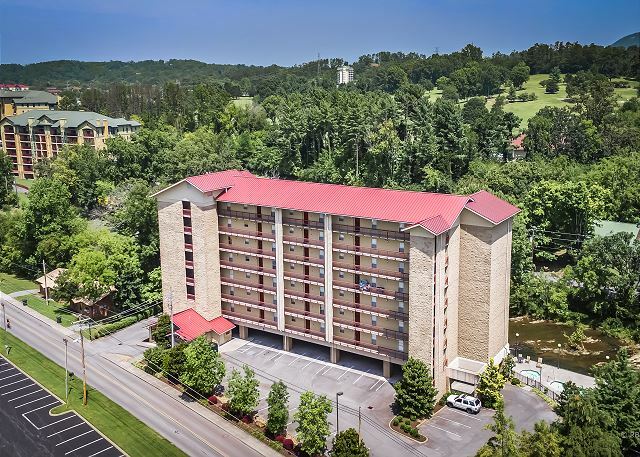 Book your Pigeon Forge Condo today! we went there to get away and get some much needed rest. and that is what we got. The place was very nice and we got some rest. Thank you so much for staying with us at Cedar Lodge! We're happy to hear that you got the rest and relaxation you deserve during your getaway in river view condo 603. We hope you'll stay with us again the next time you're visiting beautiful Pigeon Forge! Thank you for your patronage. We are happy that you had another good time at Cedar Lodge Condos on the River in Pigeon Forge. We hope that you used the free passes to see some of the shows and go to other free attractions and that you enjoyed the serenity from your balcony. We look forward to your return. 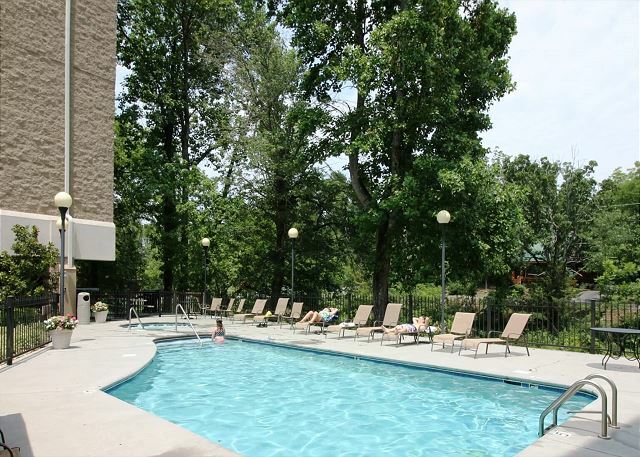 We are happy that you had a delightful vacation experience with us at Cedar Lodge Condos on the River in Pigeon Forge. Many of our guests appreciate the quietness at Cedar Lodge and its convenience to all attractions. We hope that you will visit us again. Our stay at the Cedar Lodge 603 was wonderful. 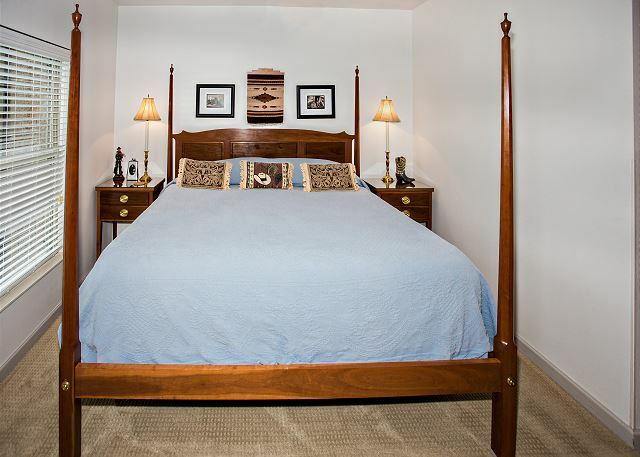 Beautifully decorated condo, beds very comfortable and a great location. Thank you so much for staying with us at Cedar Lodge! Wow, what a perfect review! We greatly appreciate your kind words about our property, and your time for reviewing your recent Pigeon Forge trip with us. We hope whenever you're visiting the area again you'll keep us in mind! Beautiful condo, very clean, well decorated. Only problem, master bedroom did not have a dresser or luggage stand to place your luggage or unpack your clothing. Thank you so much for staying with us at Cedar Lodge! We will certainly pass along your concerns regarding the furniture to the owners. Each unit is individually owned, so the owners are responsible for the decor and furniture. We will definitely bring this matter to their attention. We are so pleased that otherwise you really enjoyed the condo. We welcome you back to visit with us again soon! Condo was very clean. 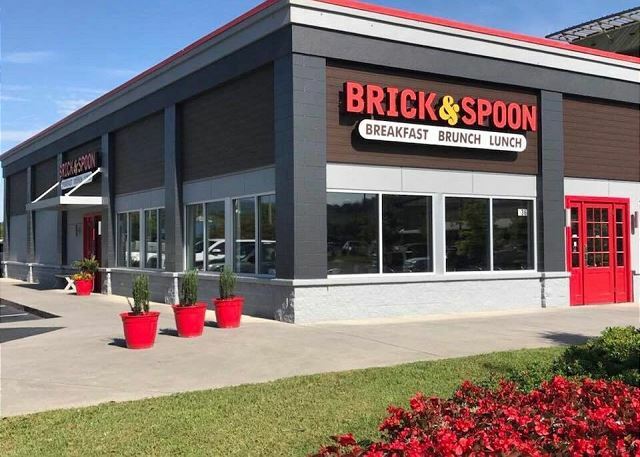 Staff was very nice and helpful. Hope to stay here again. Would definitely recommend to friends and family. Great location. Staff and housekeeping do an excellent job. Thank you so much for staying with us at Cedar Lodge! We greatly appreciate your review and kind words about our staff and our property. We love what we do and try to give our guest the best customer service we can. Our housekeeping staff strives to make sure the condos are exceptional for our guests. So it's very heartwarming to see that you noticed our hard work. Also that you would recommend us to your family and friends. Thank you again and we hope to have you back to stay with us very soon! Rented two units to fit all the family and enjoyed our stay. Thank you and we will stay again! Thank you for staying with us at Cedar Lodge! This was a well kept, comfortable condo unit with a peaceful atmosphere true to website description. The balcony was narrow but well furnished. 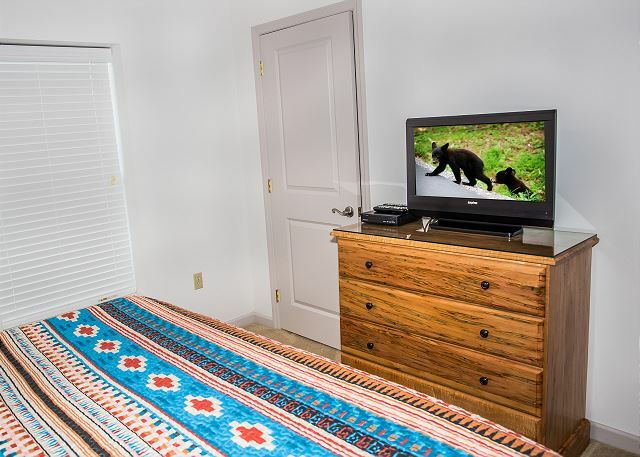 The main TV and a TV in one bedroom had zoomed in views but we dealt with that. We had such an adventurous time in Pigeon Forge. We participated in a scenic helicopter tour, hot air balloon ride, alpine coaster, the Island's mirror maze, 7D adventure and big wheel at night. During heavy rain we visited Lazerport for a laser tag game and glow in the dark putt putt golf. The Extreme go carts were awesome and Nascar's fun park was ok for the price but they need more workers. We shopped at the Tanger's outlet mall too. However, the Terry Evanswood's magic show at Wonder Works was the best!!! Thank you for your review. Sounds like you all had a BLAST! 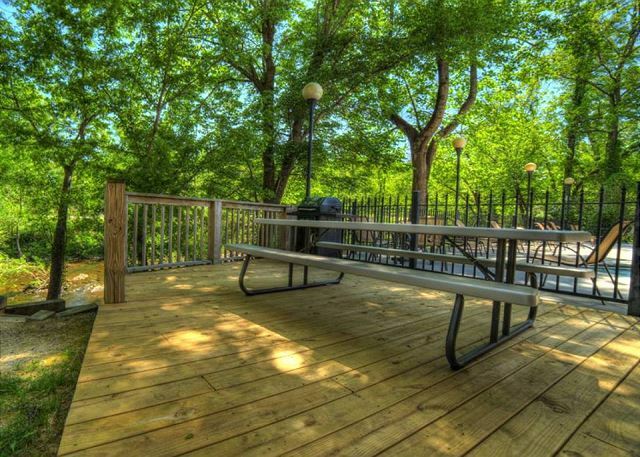 Make plans to visit us again at Cedar Lodge Condos on the River in Pigeon Forge, TN. We always enjoy staying at Cedar Lodge. Very peaceful. The condos have always been clean and homey to us. This was our third visit here and will stay here again. We are so happy to hear you enjoyed your third stay at Cedar Lodge! Thank you for continuing to stay with us on your trips to Pigeon Forge! It was great. It was very clean! Great location near Dollywood and Dixie stampede close to Gatlinburg as well. We are so pleased to hear you enjoyed your stay with us at Cedar Lodge and the convenient location to local attractions. We appreciate your patronage and look forward to your next visit! We were thrilled to find the unit we stayed in beautifully decorated, exceptionally clean and in a great location. The office staff was friendly and ready to help us with information about the area and offered to help with anything we needed. We couldn't have been more pleased. Thank you to all who made this stay great! Thank you for your excellent review. Glad you found your home away from home. Comfortable, Clean, Warm - had everything we needed. We are pleased you enjoyed your stay. Thank you for staying with us! A WEEK 0F WONDERFULL HEAVEN! THE CONDO WAS BEAUTIFUL. WE FELT SO AT HOME AND THE LAYOUT WAS SO RELAXING AND WE FOE SURE WILL BE BACK. WE HAVE BEEN COMING HERE FOR YEARS AND ALWAYS COME BACK. THANKS FOR A WONDERFUL TIME. Thank you for continuing to stay with us, we appreciate your business so much! Thank you so much for staying with us at Cedar Lodge on the River. We appreciate your kind words regarding the cleanliness of the condos, our location and the staff. We hope to see you again soon. We were very pleased with the property. It was very clean and was perfect in size and location. Thank you for staying with us. Cedar Lodge is a wonderful property and we are thrilled to hear you thought so as well. Thank you so much for staying. We certainly hope you will choose to stay with us in the future! This was the first time our little family (of 3)has rented a condo. Because our daughter brought a guest and because we were staying a week, we thought it would be logical. We were right and we could not have had a better first experience. The condo was super cute, well-appointed and clean! We loved it and would love to stay there again. Staff assistance upon check in and out was great as well. Thank you. Happy to hear your whole family and guest enjoyed your trip at Cedar Lodge! Thanks for visiting and come back soon! Our condo was nicely decorated, very clean and in a great location. Happy to hear you enjoyed the condo Alana!